A few months ago when I was shooting the “Off the Grid Artist” episode in Sheep Mountain, a carpenter came up and asked me what I was doing. He was working on Wendy Smith-Wood’s cabin at the time. I told him about Indie Alaska, and then he told me about his old timey family band. Folks, you just can’t plan for this kind of luck. 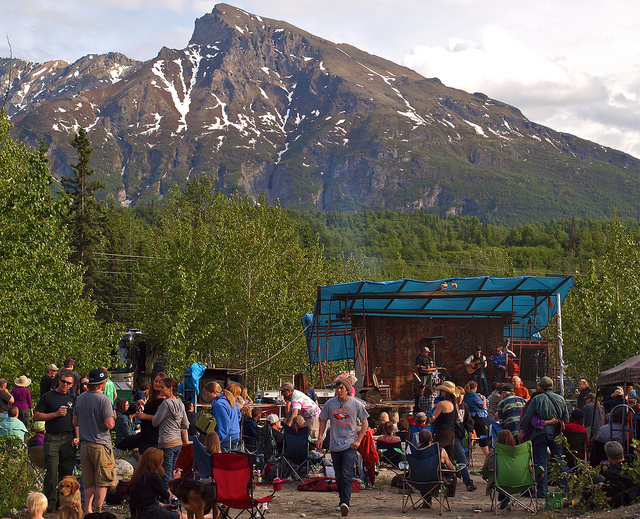 In Alaska, the Overbys are renown in the bluegrass scene for putting on the Granite Creek Bluegrass Festival every summer. It’s possibly the most authentic pickers fest in the state – the majority of attendees are musicians, and to preserve the authenticity of the festival, they don’t even announce the concert date until about a week prior on the Borealis Bluegrass Breakdown, a show on KNBA 90.1 public radio. 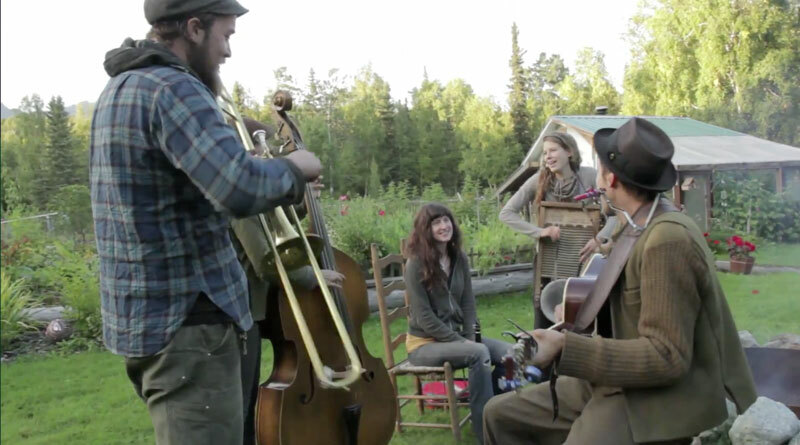 Unfortunately, I have never made it to the festival (I don’t think my guitar skills are ready for 12-hour campfire jam sessions), but the family story sounded perfect for Indie Alaska. 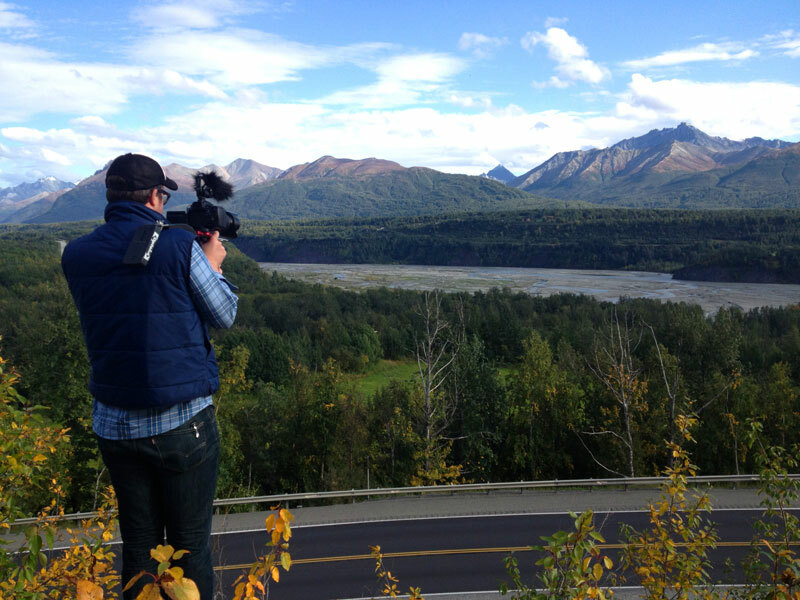 So Travis Gilmour and I drove out to Sutton, Alaska one day, and within 10 minutes we caught Jason Overby driving by. This is definitely a small town. Travis shooting the fall scene above the highway by Sutton. We started at the Sutton Library, where Jason’s girlfriend and sister were silkscreening t-shirts. And then we went to his other sister’s cabin-in-process. 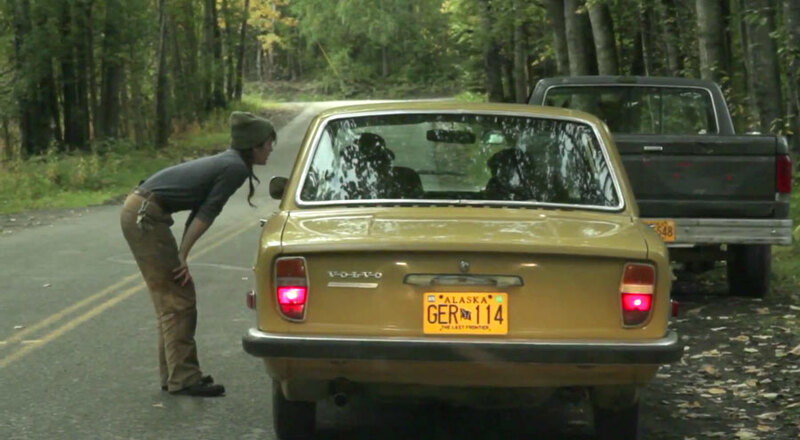 Jason and his family embody old timey values, and his choice of an old Volvo, their cabin building process (using only recycled wood from the area), and their gardening all fit into their world views. 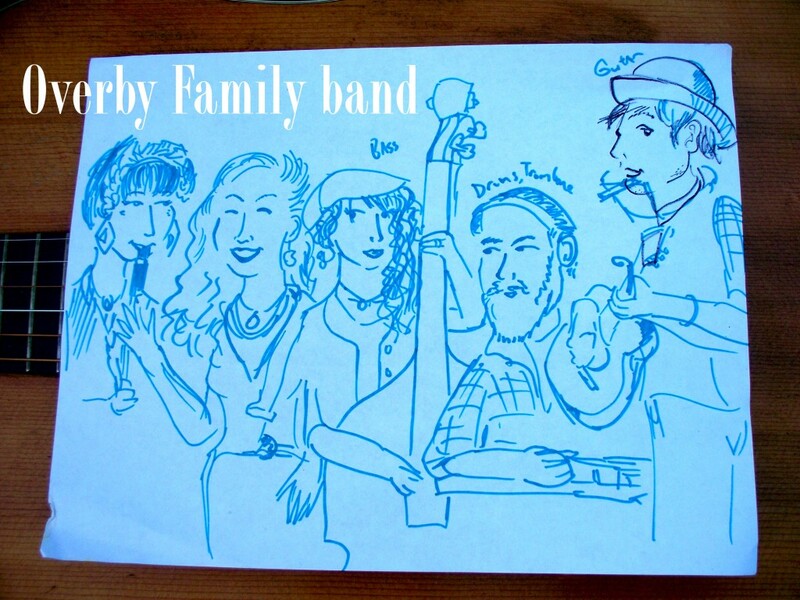 After a tour of their homes and livelihoods, we went to record a couple live performances at the home of Charlie Overby, the family patriarch. Travis and I manned two cameras with audio recording from a Lav mic (hidden in the rocks) as well as directly to our cameras via shotguns. It wasn’t a high end recording, but it worked. The thing I most realized while shooting the Overbys performing is, man, these guys really love hanging out and playing music together. Afterwards the Overbys started cooking a meal (with all the ingredients harvested locally), and Travis and I set up for interviews outside their shop. The light was quickly fading, so right off the bat we used two battery-powered 500 LED lights instead of our typical one light for indoor interviews. 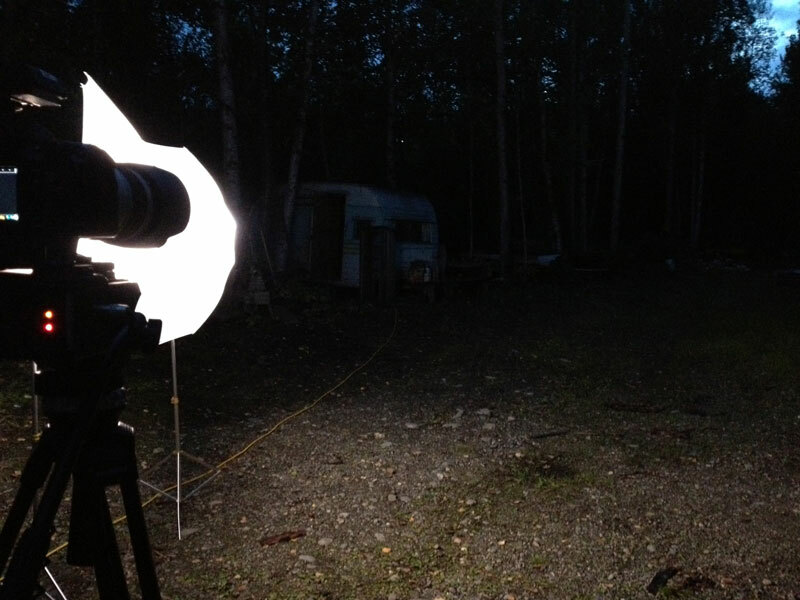 And then when it got completely dark, the Overbys found some shop lights that we could plug in to long extension cables, to light up the trailer in the background. That way the background wasn’t completely dark. It worked out really nicely, I think. And here’s what two fully lit lights with umbrellas look like in complete darkness. After all was said and done, Travis spent the better part of an entire weekend editing 3 extensive interviews into a short 7-minute edit. 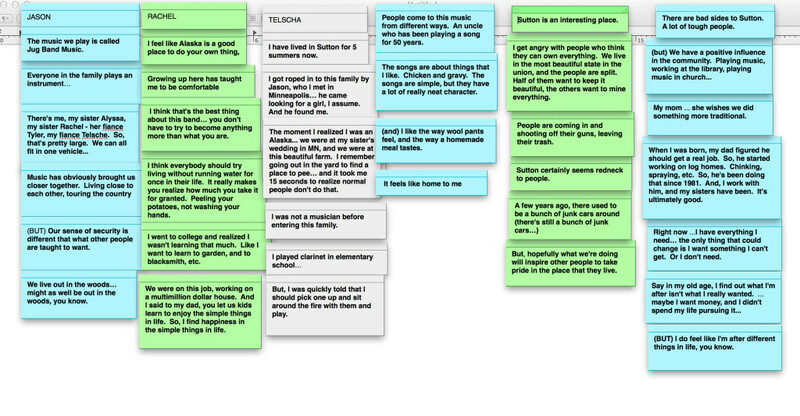 He basically transcribed most of the interviews, and then we put the story edit together using Stickies. This is pretty essential when you have so much interview material to work with. In the end, Travis worked the radio edit a bunch more before starting to lay down the B-roll, as well as finding room for the multicam song performances. But it was worth the effort, and we made some pretty cool new friends in the process!